Nicole Voirol, 25, lays on her stomach as Jessica Friskney, a tattoo artist at Tattoo Fort Wayne, tattoos a piece on her back during Devil's Hollow Tattoo and Art Festival on May 20, 2016, at the Grand Wayne Center. Voirol has close to 30 tattoos, but this is her biggest. Friskney designed the piece and is entering it into the tattoo contest that takes place at the end of the three-day-long festival. Ziara Glenn, 6, slow dances with her father, Jamaar Glenn, 26, to a song at the Daddy Daughter Princess Ball on June 17, 2016, at the Fort Wayne Community Center. 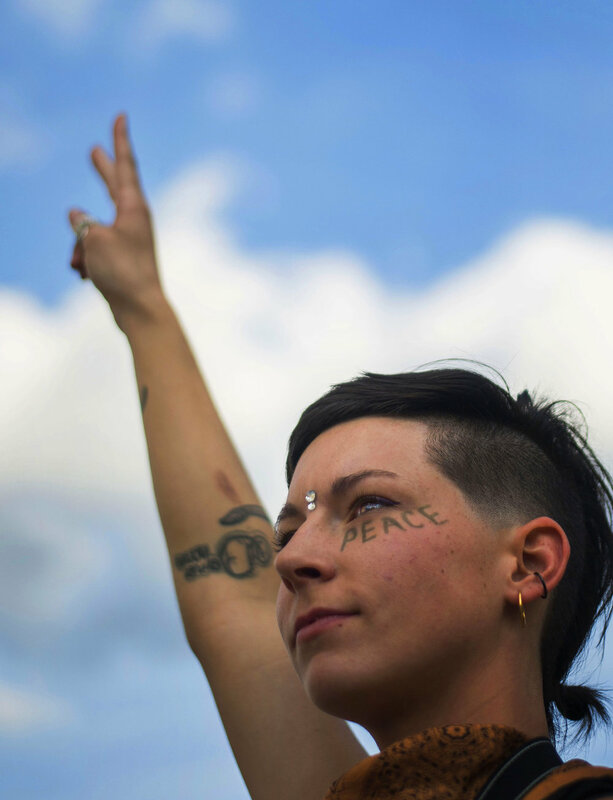 Audrey Conn, 25, stands with a peace sign in the air on the corner of Clinton and Berry streets on June 10, 2016, during the Silent Protest. Many passerbys took photos and videos; those driving honked their horns. Randy Black, 53, gets his mustached shaved by Uriah Rex, a member of FreeThought Fort Wayne on Sunday at Be There & Cut Hair at Freimann Square. "I haven't shaved my mustache since I was 13," said Black. The event was modeled after a similar one in Los Angeles that gives haircuts to the homeless and street people. The Spay/Neuter Clinic works with various humane societies and rescue organizations to do spays and neuters for them. On June 30, 2016, Soul Dog Rescue and Rehab and the Noble County Humane Society brought animals in for the last day. Assistant Professor Thomas A. Price will be retiring at the end of the Spring 2017 semester after 20 years of teaching. He was previously an adjunct photography instructor and teaching assistant at Syracuse University. He was instructor of photography at the Canada Yearbook Company and the Empire State School Press Association. Price graduated from the University of South Carolina with a Bachelor's Degree in English in 1972, and received his Master's Degree in communications and photography from S.I. Newhouse School of Public Communications in 1997. He has been primarily interested in the visual story-telling aspects of journalism, focusing on photojournalism. Bill MacKenzie, 57 of Long Island, New York, starts to clean under his 1957 2-door Bel-Air Sedan on July 1, 2016, at the Hotel Fort Wayne. Judges score the cars on a 1,000-point scale and check the whole car; outside, interior, under the car and the engine. A color guard member waits on the sidelines during the performance on Aug. 8, 2015, by Northeastern High School marching band in their show “Imagine” at the Indiana State Fair. Northeastern advanced to the finals. Miller Kern, a senior at Ball State, sits in the cooling room of the Dr. Joe and Alice Rinard Orchid Greenhouse. Kellen Hazelip stands in front of an Ivy Wall in Muncie, Ind.